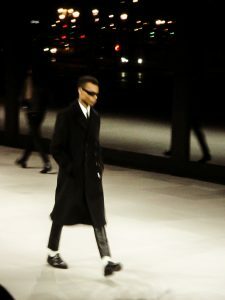 At his Celine debut in September, Hedi Slimane introduced the French fashion house to menswear for the first time. 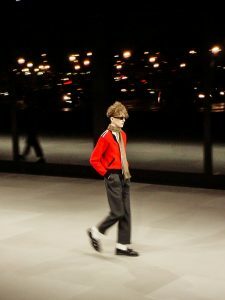 Over the weekend, Slimane presented Celine’s first-ever men’s collection in Paris, excavating the most triumphant touchstones of his menswear roots—including the slim-cut rock star suiting he boldly pioneered at Dior Homme. 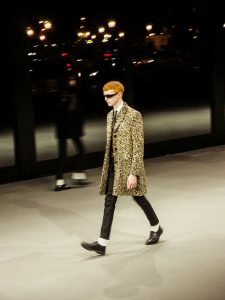 As always, Slimane drew heavily on music and youth subcultures, this time paying homage to the emerging British indie bands he was listening to while traveling between Los Angeles and London. 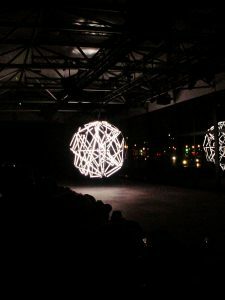 But the French-Tunisian-Italian designer’s influences can never be confined to one subculture, geographic nor sonic. 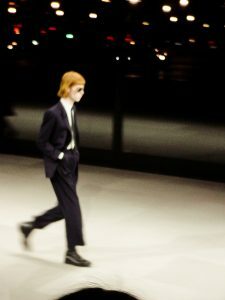 As the showspace was flooded with a turbulent composition by Canadian post-punk collective Crack Cloud, the opening look—a double-breasted black suit worn with a bowl-cut and new wave shades—was followed by heavy nods to New York no wave, and Berlin-era Bowie (Slimane was a lifelong fan). New York no wave legend James Chance closed the show with a saxophone jam. 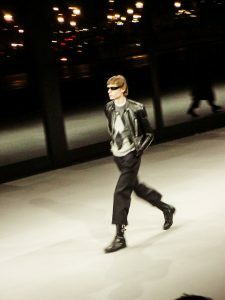 Skinny leather trousers and wool suiting separates arrived mixed, matched, and layered under a selection of decade-spanning outerwear. 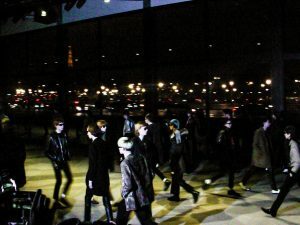 Amongst the objectively covetable pieces that might see the streetwear crowd placing pre-orders alongside Slimane stans: army-green parkas, loose tweed toppers, and shearling coats in jet-black and velvety mustard. 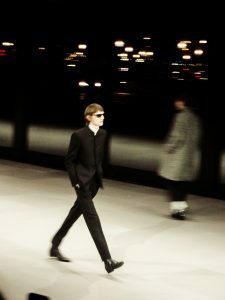 Skinny ties were complimented by equally skinny scarves, and paired with preppy knitted sweaters. 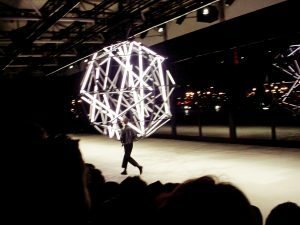 Slimane isn’t interested in adding his name to the list of designers trading in streetwear—he knows too much about what the luxury customer wants to need. 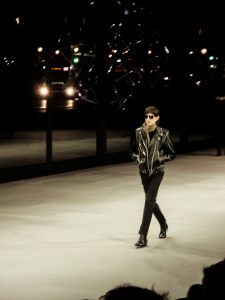 But there’s a reason he increased sales at Saint Laurent by 150% over four years. He knows what people on the street want too.